At Carmichael’s we offer a great selection of athletic apparel for many different schools and occasions. 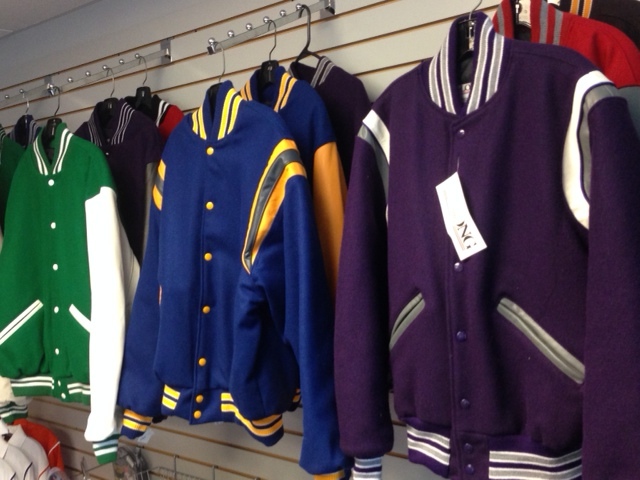 We can take letter jacket orders for student athletes, and we have custom apparel to make the fans look good, too! Tackle twill, custom embroidery, hats, and school t-shirts can all be done through Carmichael Sports. We also can special order many different items to fit your individual needs. Carmichael Sports can be your source for letter jackets for student athletes. We stock plain sample letter jackets in a variety of different colors to suit a number of schools. Just bring in any letters, numerals, and patches you may have received from your school, and we do the rest! Also available are custom, sport-specific patches and designs, so feel free to ask what we can do for you. Again, our prices have consistently matched up well with our competitors, and we are proud to be able to offer this product and service to high school student athletes. We have jackets for all local schools! Come in and make yours special! We always stock t-shirt designs for Wooster, Triway, and most surrounding schools. These shirts can be made up while you are in the store without the need to place an order and wait for it to be shipped. We are also able to take custom t-shirt orders for businesses, teams, camps, and other events. Our prices have proven to be competitive with many area retailers, as well.